"Potential Medical Causes of Aggression"
Thyroid-Dysfunction: Hypothyroidism is the most prevalent endocrine disease in dogs. The hypothyroid dog is generally thought of as being lethargic and mentally dull, however, aggression and hyperactivity are also common responses to a low thyroid level. Thyroid dysfunction as a potential cause of aggressive may go undiagnosed because the behavioral signs often precede the more traditional skin, coat and metabolic changes characteristic of hypothyroidism. This condition can be detected through a blood test and treated through synthetic hormones. Brain Chemistry: Serotonin is thought to play an important role in the neurochemical control of aggression in the brain. The family of SSRI drugs may be helpful in treating aggression related to brain chemistry. Canine Rage Syndrome: This condition is characterized by sudden episodes of aggression, often directed at the dog's owner (or other people most often around the dog). Many owners report that the episodes are completely unpredictable. Others report that the episodes are triggered by specific stimulus that varies depending on the dog. The episodes are characterized by extreme aggressiveness, often including multiple bites or bite attempts, and the episodes stop as suddenly as the begin. Dilation of the dog's eyes are often reported prior to the attack. And the dog is often said to seem confused or "remorseful" about what he has done following the attack. There is a lot of speculation about the cause of this syndrome. The two most common theories is that it is either a form of seizure, or that these dogs have an underlying chemical imbalance (such as reduced serotonin levels) that are associated with similar violent outbursts in people. Many people prefer to refer to canine rage syndrome as idiopathic aggression because the condition is not really related to human emotions such as "rage" or "anger." However, the term idiopathic aggression more properly refers to sudden unpredictable outbursts in which no underlying neurological or other medical condition is present. Canine Rage Syndrome is sometimes also referred to as Behavioral Seizure disorder. Epilepsy: Seizures occurring in a region of the brain that controls aggression can cause sudden unprovoked aggression. Depending on the location of the area of the brain that is affected, a dog having a complex partial seizure may exhibit behavioral, but not physical, signs of the seizure, including aggression. These types of seizures cause distortions of thought, perception, "emotion" (an increase in fear, or aggression), and visual and auditory hallucinations. Physical signs in addition to aggression could include one or more of the following: sudden lip-smacking, chewing, "fly biting," vocalization, hysterical running, cowering, vomiting, diarrhea, abdominal distress, excessive salivation, blindness, unusual thirst or appetite, and flank biting. Dogs that experience visible physical convulsions, are often more aggressive immediately following the seizure. Dogs in either state are not fully aware of what they are doing. Epilepsy is treatable with medication, but diagnosis is sometimes difficult in dogs that are experiencing complex partial seizures. Hypoglycemia/Diabetes: Dogs, like humans, can be either diabetic or hypoglycemic. Both diabetic and hypoglycemic dogs can go into a state of very low blood sugar. Symptoms include moodiness, irritability, aggression, staggering or collapse, weakness, and staring with a glassy-dazed look. Hypoglycemia and diabetes are easily detected through a blood test. Cognitive Dysfunction Syndrome: degenerative changes in the brain, resulting in brain cell loss can cause aggression in dogs. This condition is typically associated with advanced age. In addition to irritability and aggressive behavior some of the other symptoms may include sudden unexplainable anxiety and/or disorientation, aimless wandering, inappropriate elimination ("accidents" in housetrained dogs), social detachment, changes in activity level, and changes in sleep-wake patterns. Brain Tumors: A brain tumor can cause changes in temperament including aggression, confusion, irritability, increased vocalization, apathy, hyper excitability, tremors, weakness, disorientation, visual deficits, circling, falling, sleep habits, abnormal postures, exaggerated gait, head tilt, pain, house soiling, staring, trembling, decreased appetite, seizures, paralysis. Encephalitis: Both bacterial and viral encephalitis (distemper) are known to cause aggression in dogs. But any condition that causes inflammation of the brain can cause neurological signs, including aggression. Head Trauma: When the brain has suffered an injury, swelling or bleeding may result. This can in turn interfere with the normal function of that part of the brain causing unusual neurological symptoms, including aggression. Problems with diagnosing a dog as "aggressive" arise from human misunderstanding of canine social systems, canine signaling, and canine anxieties about contextually appropriate responses to unfamiliar situations. A diagnosis of an "aggressive temperament" should not be based on a one-time event. Often the dog has been displaying signs of an upcoming problem (unbeknownst to the owner) and has been allowed to continue the behavior until it has escalated to a full scale problem. Diagnosis of aggression, and the cause of the aggression, requires an evaluation (by qualified medical and behavioral specialists) of the type of behavior that the dog is displaying, the dog's medical condition, its background (if known), and its present environment. Treatment for aggressive behavior can include medication, but most often includes behavior modification in conjunction with an experienced behaviorist or trainer. Rehabilitating a truly aggressive dog is not an easy fix. Aggressive behavior does not develop overnight, and cannot be "cured" overnight – or by sending the dog away to a training camp. Management of an aggressive dog requires constant commitment, consistency, and follow through from the owner of the dog, for the life of the animal. If your dog is exhibiting aggressive behavior seek the medical advice of a licensed veterinarian, and training advice from a professional animal behaviorist knowledgeable about your breed of dog and the specific type of behaviors that you are concerned about. Many licensed veterinarians keep a list of recommended behaviorists in your area. The trouble with that is some people take every growl and a Chow not responding the way they want as aggressive behavior, every growl, snap or bite can not be taken as a medical problem. Most vets are going to try and sell all the medications they can even if there's nothing wrong. Most of the aggressive behavior people post about is lack of knowing they have a Chow not a dog and don't know how to deal with it. If I took Pekoe in every time she snapped or growled at someone in the past 10 years I would have been at the vets 24 hrs aday every day and pekoe would be a walking drug store. The lady that posted about the Chow biting her parents, just from her post you can tell there's been a big lack of discipline going on, the parents have never done anything in the past to stop the behavior now the Chow is older and running the house I doubt there is anything medically wrong with that Chow. Thinking something is always medically wrong reminds me of back when they were doing lobotomies (sp), if your kid didn't act the way the book says cut his brain out. Thanks for posting this list. It's really helpful. This was particulary interesting. Ginger has this exact reaction after biting. My Sheena is pretty aggressive and I have definitely seen canine rage in her! Don't enter her space or pet her unless I say it's OK and I determine she's in an OK mood. AND don't touch anything we own, and Troy whatever you do don't go near her food or you'll be a squealing in pain! Only two people have entered my house in the past 3 years. And she has growled and attempted to bite them and has nipped at people's clothing at campgrounds if they came into her space-luckily the clothing was loose. In public Sheena also has her limits with people and animals. She is more polite but even at the CA Chowfest she surprised people by attacking Troy over some food and growled at someone who was holding her leash for quite a while, while they both were on the ground. The girl was even petting Sheena, stopped for a while, went to pet Sheena again and Sheena snapped/growled but they both could still continue sitting there without any problem (just don't pet Sheena again)! Some chows can only take so much affection/attention and are real loners. I actually find myself very similar to her-I can only take so much of people myself and consider myself a loner. Sheena is a totally healthy chow. I see her aggressiveness as a protective behavior and just selfish about sharing her food. Maybe a result of her prior 3.5 years before me. Yep, she has that look of remorse after the incidents. That's just a front to appease me. Inside she's saying "I'm the Protector, I'm the head Chow, until Jennifer steps in and puts me in my place." So I agree with you Jeff. Personally, I feel that some dogs and people just get to a point where they just can't take it anymore! Whatever it is. Everyone, even animals have a breaking point some more often than others and it has nothing to do with medical or psychological imbalances. Some Chows and people just need their space and I prefer to allow them to have it! I can do just about anything to Pekoe I want, I can move her food in the middle of eating, I can take food out her mouth and when I say get that crap out of your mouth she will usually drop it but when she sneaks in and steals something, chicken bone, paper or toilet paper then tries to sneak outside I know there is going to be a battle its full teeth, growls and going for the big bite, I have to take a broom and move her or throw a towel over her head. If I see her with something in her mouth she will drop it but theft, that's big business to Pekoe she will fight. The other day She grabbed a chicken breast off of Connors plate and ran for the door, she would have killed me with out a thought, It was an all out battle getting the chicken breast from her. Most would look at that as extreme aggressive behavior and start running for the help line, I see it as a Chow with a stolen Chicken breast in her mouth so I would expect aggressive behavior, Like I said your dealing with a toddlers mind you would get the same reaction pulling a toy out of a kids hand at wal-mart..If you spoil your kids or Chows your going to have to expect an outburst at times. I have to admit that I am getting confused. It seems like some people are saying that aggression can be treated through either finding a medical cause or by using proper behavioral methods. The last two posts I just read make me think that may not be the case. Is it just the Chow nature and it can't really be changed in some dogs? I thought people were saying that aggression can be corrected. My parents didn't know they adopted a dog that would need to have a towel thrown over her head or be moved with a broom. This is quite frightening. lms wrote: I have to admit that I am getting confused. It seems like some people are saying that aggression can be treated through either finding a medical cause or by using proper behavioral methods. The last two posts I just read make me think that may not be the case. Is it just the Chow nature and it can't really be changed in some dogs? I thought people were saying that aggression can be corrected. My parents didn't know they adopted a dog that would need to have a towel thrown over her head or be moved with a broom. This is quite frightening. How long have your parents had the Chow and how old is the Chow? Your only paying attention to the word aggressive, nothing was said that a Chow is any more aggressive then any other breed, what was said is aggressive behavior is looked at differently by people, my Chow is extremely spoiled she gets away with just about anything, I don't treat her as a dog or a pet so like any breed of dog or child lack of discipline will be a problem as they get older. I know my Chow and she knows me she gets away with allot but she knows there is a limit, My Chow and I have been together for 10 years an occasional chicken bone fight doesn't bother me. I have a spoiled daughter, a spoiled grandson and a spoiled Chow all 3 are nuts. As far as the broom or towel I don't know to many dogs or animals that you could pull a Chicken breast out of its mouth with out some kind of arguing going on unless its brain dead or sedated. You also didn't read that most of the time when I say drop it she will drop it, the theft of the Chicken breast and her reaction is what I expected because it took allot of planning for her to steal it plus it wasn't her fault the chicken was on a plate left on the floor it was my fault not hers. with me as long as my Chow isn't attacking people and stays out of the street she can do just about anything she wants. There are many reasons a ANY breed might be aggressive and its not all medical allot of people are to quick to think its a medical problem then start giving their Chows unneeded medications which usally causes more problems later on. A chow is no more aggressive and probably less aggressive then most breeds, its all in how you handle what you consider aggressive behavior and how much you understand the breed you have. All so called aggression can be corrected and its not with a bottle of pills, you have a Chow not a poodle learn about the breed you have and Don't go by how I or anyone else raises our Chows we all have our differant opinions of what we call bad behavior or aggressive behavior and how much we let our Chows get away with. If it were me and I have done it with aggressive behavior toward a Child, every time your Chow snaps, bites or growls I would either slap my hands together or slap a magazine on the table, anything that makes a noise to get their attention then say a firm NOOOO and send them out of the room, It dosn't take much to train a Chow you just have to take the time and be consistant. 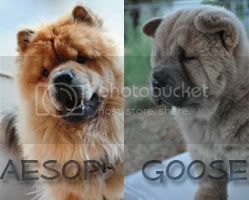 In about 2 weeks to a month your Chow won't be snapping, biting or growling at you or who ever owns it. Sooner or later it will snap or growl about something but it won't bite. Chows are an extremely intelligent breed they will always try to take control its up to you how much control you let them have. Thanks kiwani, that was a fantastic post! This is the best advice, anyone experiencing aggression issues should do this and go from there. The only thing that could happen is that the vet and behaviorist say "oh that's all normal" or you could wind up finding something important out about your chow. You may wish to pm Layla and see if she will discuss her sweet Milo with you, it may be too painful for right now but she can tell you how her quest for aggreesive behavior answers led her to some very serious medical conclusions. She's an amazing chowmom! This is very, very true!!! Patricia McConnell also talks about this in her book "The Other End of the Leash" (I'm getting to be for this book what Jeff is for Nutro and Sam is for ProPlan! ). She says to remember that just like us, ever dog will have a varying degree of a desire to be social and that of course, even within a breed not every individual will be the same. I highly recommend every chow owner read this book, I think you'll all be very pleased about her attitude,knowledge, and commentary on behavior. "And the dog is often said to seem confused or "remorseful" about what he has done following the attack"
Re: "This was particulary interesting. Ginger has this exact reaction after biting"
Do a forum search for the keyword "hypothalamus" in the recent archived threads. One part of the hypothalamus regulates aggression and rage, another part regulates calm. The archived threads mention the things that can go wrong with the hypothalamus, and that the 'calming' section can go 'offline' (when serotonin plunges for instance). This is the 'control hub' I refer to, in your other thread. Re: "Thanks kiwani, that was a fantastic post!" I've used it several times before, and it was just easier to repost it fresh. Here's an archived thread with a possible rage seizure/reflex seizure. "Re: "...but she can tell you how her quest for aggreesive behavior answers led her to some very serious medical conclusions"
Yes, that's the archived thread where we discussed the hypothalamus and the possibility of tumors in that region. There are a variety of factors which can negatively affect this tiny area of the brain. While organic causes of behavior should be considered, I feel it is like ADD/HD diagnosis in children. All of a sudden little Jimmy's behavior isn't his fault, give him ritalin. An unheard of syndrome 30 years ago. That is not to say that the problem doesn't exsist. It is just over-diagnosed. Many canine problems are due to incorrect or incomplete early training. Some are due to genetics, and innate personality. Let's face it, some dogs are just not social creatures. No matter how much they are socialized. It is true, socialization will help overcome 'grumpy dog syndrome', and is much better than leaving a dog with an unsocial attitude to their proclivities, but just like ornery people, we will never make them into social butterflies. I'm just very concerned, and I'm trying to get to the bottom of this. A bite that requires 12 stitches is not something to take lightly, and I have been nervous about the situation since this last biting incident. So far I think the best bet is to get an evaluation from a behaviorist vet. After ruling out any medical causes then he can help with any training issues. I'm glad I posted this here. I wouldn't have thought of getting an appt with a behaviorist vet otherwise. We definitely need to put this in the hands of a professional. Thank you all again! Also, the book recommended sounds excellent. I'm ordering that for my parents. Re: "A bite that requires 12 stitches is not something to take lightly,..."
That's why it's important to review symptoms/testing of the various medical causes of aggression first. A dog with an imbalanced nervous system, who would react in such a manner, isn't going to be easy to train anyway, and the idea is to find the root cause of the problem, and try to balance it. Even if there were no medical cause to be found, the behavior that is evident, has *already* affected the nervous system wiring, and that has to be dealt with by an experienced person. Brain chemistry affects behavior, and behavior affects brain chemistry. This thread reminded me of the "manners" class Sid and I just completed. The instructors first words were - "I can show you the tools to modify the behaviors YOU want to change" Like: letting your dog on the furniture. I don't care if Sid sits on the couch, I welcome it while others want to change that behavior in their dogs. It seems that some people are able to tolerate a little more aggression then others. From both the manners class and the behavioral modification class, I learned that I need to be honest with myself and decide what I want and what I don't want from Sid. To me - I better be able to grab what ever I want from Sid's mouth and he better not show one iota of aggression. He can huff and sigh all he wants but no more then that. I lucked out though, Sid really is a gentle Chow and I think he was born that way. LOL.. So.. I ask myself.. What do I expect from Sid? Is it relevant to his safety and mine? Is it really important that he learns or does what I expect? It's like the 3 R's of positive discipline. Give him a full chicken breast let him walk away with it and lets see what happens, I can take anything out of Pekoe's mouth but it depends on the circumstances, normally I could take it from her but at that time she wanted the breast. If pekoe didn't let me stick my hands down her throat I would have never found the cancer but differant situations call for differant actions. Pull a candy bar out of a kids mouth and lets watch what happens or grab a beer form your husbands hand as he's going to drink it, all depends on how well you know your Chow not what the trainer tells you it should be. Pekoe is 11 years old I would expect her to be getting a little cranky and irritable in her late senior years, She's not acting any differant then any of you woman when you turn 77, standing out in your yard in your torn bath robe waving your broom in the air yelling "you damn kids, You better stay away from my petunias or yelling at your husband, "Damn it Herald put the cap back on the prune juice you know I need it for regularity". Give me a dog bite any day over that, Pekoe is doing fine as far as i'm concerned. Having said all that (both Jeff and myself), If I woke one day to fing either of mine, or Jeff with Pekoe, had suddenly turned into Old Yeller after he went rabid, I would consider an organic reason first. Re: "Potential Medical Causes of Aggression"
Ever watch Dog Whisperer, folks? What Cesar teaches is true of even Chows and their unique personalities. You CAN NOT let them get away with bad behavior. The FIRST time they ever growl at you, you need to have a come-to-Jesus-meeting right then and there. You have to establish yourself as Alpha dog/human. They understand that. I think, also, that a big thing to take into consideration when evaluating aggression in your dog is: 'what is your dog's normal behavior, and has it changed'. Jeff obviously knows Pekoe well and knows that aggression will be shown in certain situations. Obviously, running to the vet if she gets crabby over a choice tidbit now and then isn't going to justify a hasty trip to the vet. If Legend started growling at me over the same situation, I probably would go to the vet, as that's not his normal response. (and yes, I have had to fish an entire chicken breast out of his throat....sneaky little garbage picker I've also had to grab a rib bone, various scraps, and ..one memorable time...some long dead creature he found outside and brought in, happy as could be ) Some dogs are more crabby than others in certain situations, but if a behavior changes drastically, it can mean a medical condition. While I'm sure there are vets out there that are less than desirable, most do not want to push medications onto their patients. Our vet tries to avoid any medication whenever possible, and generally won't treat for something unless there is solid evidence of a problem.